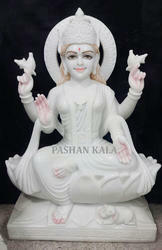 We are expert in sculpturing and exporting a designer array of White Marble Laxmi Goddess Statue. These Marble Laxmi are the admirable integration of our expert craftsmen. With the availability in various shape, size and color combination these Laxmi Statues are easily accessible at market. These Laxmi Mata Statue signify the true Indian culture and religion. 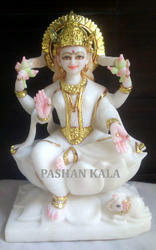 Avail from us a wide range of Goddess Marble Laxmi Idols. To meet the requirement of the clients, the entire product-line is checked at vivid parameters so that we can ensured of complete flawlessness. These marble laxmi murtis are very decorative as well and are available with us at a very commercial range of prices. With years of experience in the domain, we are engaged in the process of manufacturing and exporting of a assorted gamut of Marble Laxmi Staute. The product is manufactured under the supervision of expert and deft craftsmen so that the product can be assured completes satisfaction. Moreover, the offered product range is made, employing advance techniques and methods. Exquisite Marble Lakshmi Statue of Marble are also considered as one of the finest and greatest kinds of moorties of gods which we are providing to our clients in different parts of the country as well as abroad. These Exquisite Laxmi maa Idols of Marble are made up of highly appreciable and top grade raw materials which makes it very much attractive, lustrous and long lasting. We are actively engaged in manufacturing and exporting an aesthetic range of Colored Marble Lakshmi Maa Statue. In order to mee the variegated demand of our different client, the Marble Laxmi Maa is available in magnificent designs and size. Our offered statue is carved with qualitative marble that are finely cut, polished and finished to impart perfection to the sculpture. 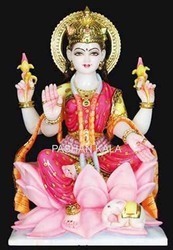 We are engaged in offering a wide range of Beautiful Laxmi Maa Statue. Handcrafted to perfection, the statue is available in magnificent designs and various sizes. Carved out of qualitative marble, the statue is available in various sizes and postures and embodies the real essence of her persona. 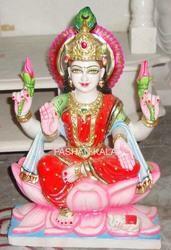 We also carve these Maa Laxmi Statues as per the clients’ preferences and requirements. 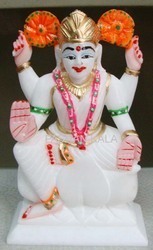 We are a prominent manufacturer of huge assortment of Colored Marble Lakshmi Statue. 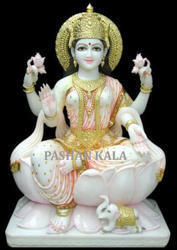 The Offered Lakshmi Murti is made with the aid of Pure white marble, procured for relevant vendors of the market. Moreover, our craftsmen handcraft the offered product, in order to ensure complete assurance to the customers. Apart from this, the entire range is checked at well-defined parameters, before its final delivery. Based on our customer-approach mindset, we strive to present our values patrons a exclusive range of Artistic Marble Lakshmi Maa Statue. The offered range is sculpted with utmost precision by our deft craftsmen, who use latest techniques and methodologies in the manufacturing process. Apart from this, the offered product is composed of authentic material, so that we can ensure our client complete satisfaction. 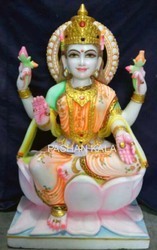 The Laxmi Statue Sitting On Lotus we offer is ideal for placing in temple and also as a decorative items. This Laxmi Statue is carved out using marble statue and is skillfully carved by our dexterous sculptors. The Marble Laxmi Maa is stark white in color but even then all the details stand out clearly. The product are highly available in the market readily at reduced price. To add on to the beauty of the home furnishing as well as to worship various god and deitie, Our clients can avail from us a comprehensive collection of White Marble Laxmi Maa. Artistically designed by the talented craftsmen of our organization, these Laxmi Maa showcase the traditional pattern with contemporary designs. 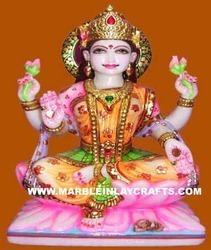 We have made these Marble Laxmi Mata in quality marble. 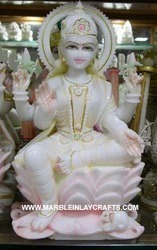 Looking for Marble Laxmi Maa Statue ?